A pretty crochet Christmas table mat uk that will look delightful on your sideboard or table during the holiday, you can use as center piece or as an extra mat during meal times, if you make it in different colours it can be used all year round. I hope you have fun crocheting it. rpt from * to * to last 2htr and dc, miss 2htr, 1dc into dc. # Twice in colour 2. Rpt from # to # 6 more time making 58 Pattern Rows in all or work measures approx 15 Inches from beginning. Turn. Edging – 1ch, 1dc into base of 1ch, * 1dc into each of next 2htr, miss dc, * rpt from * to * to last 2htr and dc, 1dc into each of the htr, 3dc into last dc, work 1dc into each row end down first side of mat, 3dc into corner, 1dc into each ch along starting chain edge, 3dc into corner, 1dc into each row end up second side of mat, 1dc into corner, ss to first dc on beginning of row. Turn. Next Row – 1ch, (1dc, 3ch, 1dc) into base of 1ch, * miss 1dc, (1dc, 3ch, 1dc) into next dc, * rpt from * to * last dc, miss dc, ss to first dc on beginning row. Fasten off. Finishing – Weave in any loose of yarn and trim off. Hope you enjoy making this pretty crochet Christmas table mat uk free crochet pattern, make sure pin it! so you can find it later. 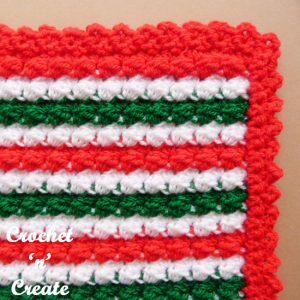 The written instructions and pictures for this crochet christmas table mat uk pattern are copyrighted to crochet ‘n’ create © 2017. 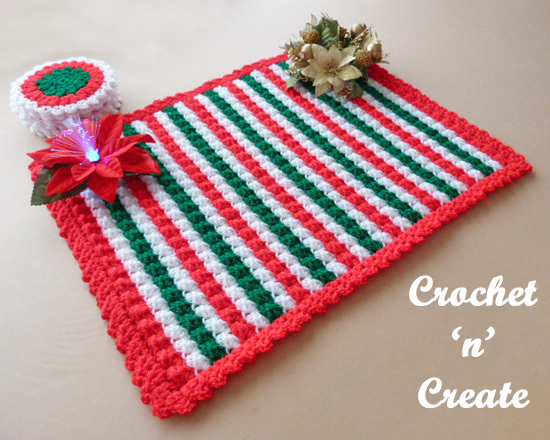 You are welcome to sell the finished products made from the free crochet Christmas table mat uk pattern, I just ask that you use your own pictures and put a link back to crochet ‘n’ create. If you wish to share this crochet Christmas table mat uk pattern on social media or your blog please only use a direct link to the pattern page on crochet ‘n’ create.